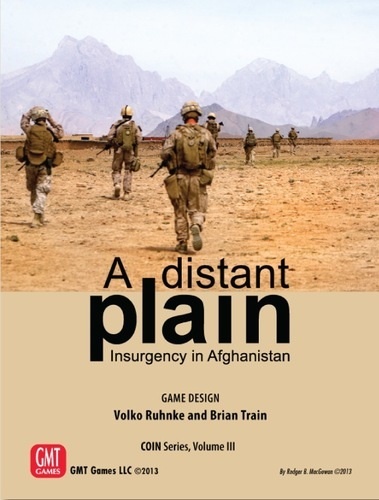 This weekend several friends and I will be getting together to try A Distant Plain by GMT Games. This is not a review, but rather my impressions of the game after only reading the rules. Before the first COIN game was released, I spent quite a bit of time reading the draft rules; at that time the game in development was Andean Abyss. At the time I was part of a small playtest group. Though I was not able to see the project to completion due to work demands at the time. I was mightily impressed with rules of that game and the COIN series concept as well. The game focuses on four factions that historically had and still do have some form of influence in the region. These four factions are divided among the players, one to each. In a learning game a player could have two factions if there are less than four players. In a non-learning game there are built in mechanics to independently run one or more factions through the use of charts. This use of charts is also the mechanic by which to play the entire game solo as well. Not a bad selling point for the games either. God knows we Wargames like the ability to play solo and when it is built in from the beginning that is a plus! The four factions involved are the COALITION, the player taking this faction represents the US and coalition forces involved in the war. Next up is the GOVERNMENT, this faction represents the Afghan government. Next is the WARLORDS, this faction represents the various tribal factions that dot the landscape in Afghanistan. While I real life the Warlords are not unified for or against the Taliban or the government for that matter, that aspect has been factored into the rules. Last in the TALIBAN, this faction represents none other than the Jihadist forces of the Taliban. So, as you can see the four factions are not necessarily aligned with another faction, but through game play alliances will be formed and broken. One must remember that each faction has its own winning conditions and is ultimately out for themselves. GMT Games donated a copy of the game to the game library I maintain for BROGFest; it was nice to see the game was checked out and saw some table time at BROGFest last weekend. I would occasionally observe the folks playing from time to time and it seemed like they were getting the rules down without to much difficulty. Again, my interested was piqued. This past week I read the rules in preparations for this weekend. I must say I am impressed at the way in which they are written, the layout and the flow of the rules. My hat’s off to the designers, Volko Runke and Brian Train, for doing what some seem to have trouble doing, laying out rules in a functional way. I know I can’t fully appreciate the rules or the nuances of the game until we get it to the table, but the rules have done their job and left me feeling good about the core mechanics. That being said, there are still a few aspects of the game that I am a little foggy on. For example, we are going to play a three playing game and during a learning game the rules recommend that the government player also take the warlords. This seems odd as they are an opposing faction in the game. Yet there is some commonality between the two in terms of shared resources. I guess I will just need to see how this works when we play. I am looking forward to playing this. I will be sure to write up my thoughts after the game this weekend. I am anxious to hear your thoughts after playing this. I will post my thoughts early next week, if not sooner.